Remember when you were a kid, and you used to hope and pray for heavy snow, so school would get canceled?. If you lived in a warm climate you missed out on this, the best part of a child’s winter outside the holidays — not only did you get a free day off from school, but you got to go outside and play in the snow. And that usually meant flying downhill on a sled or a toboggan. Well, now you can relive your youth — or find out what you missed — in and around Banff, Canada and Banff National Park. Have kids of your own now? Bring them along and introduce them to the pure and simple joy of sledding. The Canadian Rockies in winter isn’t always world-class downhill skiing and snowboarding, Olympic Nordic skiing, and epic snowshoeing across endless, sweeping mountain vistas. Sometimes we simply drag the ole’ toboggan up a hill, just so we can go careening back down with a delighted squeal. While us locals in Banff and Lake Louise take advantage of backyards – one more advantage to living in the Canadian Rockies – not to mention side streets and parks for sledding, there are a few designated areas. Behind the Fairmont Banff Springs hotel and resort there is a toboggan run; next to Bow Falls there is excellent sledding terrain (i.e., an excellent hill). A bonfire pit is often blazing at the ice rink at the other end of the hill, so sledders don’t have to go far to warm up. Banff’s Cascade Ponds (on Minnewanka Lake Road) is another nice spot with smaller and slower hills that are perfect for toddlers and youngsters. 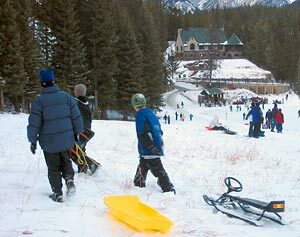 Toboggans and sleds can be rented at the Fairmont Banff Springs Hotel, and at Ski Tips in on Bear Street in downtown Banff. They are also available for purchase at Banff’s Home Hardware on Bear Street.